Lateral ankle sprains are one of the most common sports injuries presenting to Dr7 Physiotherapy and Podiatry Yokine. We provide Physiotherapy and Podiatry services to Yokine, Dianella, Joondana, Tuart Hill, Osborne Park, Coolbinia, Mount Lawley, Bedford, Inglewood, Balcatta, Stirling, Nollamara and surrounding suburbs and are extremely experienced in managing your rolled ankle. In this area we have a large proportion of young people participating in competitive sports such as netball, basketball, soccer and football. These are all sports that have a high incidence of ankle sprain due to the volume of running, jumping, pivoting and twisting movements necessary. 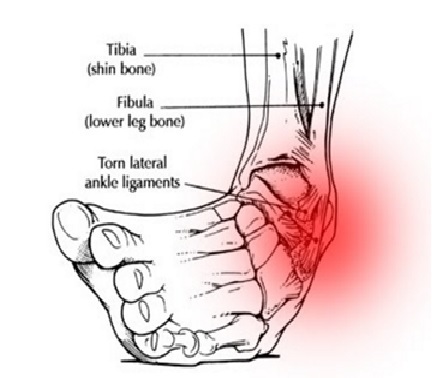 An ankle sprain is almost always managed conservatively (non-operatively). The goal of treatment here at Dr7 Physiotherapy and Podiatry Joondanna is to reduce inflammation, restore normal movement, and then improve strength and proprioception in the later stages of recovery to facilitate a safe return to sport. Physiotherapy: your Dr7 Physiotherapist can provide additional treatments including ultrasound, massage, mobilisations, hydrotherapy, taping and exercises to facilitate a quicker recovery following acute inflammation. Following the initial phase of inflammation, your Dr7 Physiotherapist will prescribe you with a set of exercises to restore normal movement, improve muscle strength and proprioception of the ankle. This is the most important part of your recovery as it drastically reduces your chances of re-injuring the ankle. Your exercise program will be specifically tailored to you based on your specific injury and sport. Your Dr7 Physiotherapist will then ‘coach’ you through the return to sport phase by giving advice on when to return to running, returning to agility exercises, returning to training and eventually returning to competitive play. Once you have completed a rehabilitation program and are ready to return to play you may need to consider whether to tape/brace during training and games. Taping/Bracing provides support and passive restraints to extremes of movement, as well as assisting with proprioception around the ankle. In moderate to severe cases where ligaments are very stretched and torn there may be ongoing laxity in the ankle, meaning that taping/bracing is recommended for future games. It is also important to continue with stability and balance exercises going forward to prevent future injury. If you have any questions regarding ankle sprains or other injury don’t hesitate to contact Dr7 Physiotherapy and Podiatry Tuart Hill for a consultation. Book an appointment online through Health Engine. This is located on our website com.au. Simply click “book an appointment” and you will be guided through the steps. Dr7 Physiotherapy and Podiatry provides services to Yokine, Dianella, Joondana, Tuart Hill, Osborne Park, Coolbinia, Mount Lawley, Bedford, Inglewood, Balcatta, Stirling, Nollamara and surrounding suburbs.